So what can you do in five to ten minutes to meet this list of requirements? Step 1: Buy some nutritionally dense Super-hero foods! 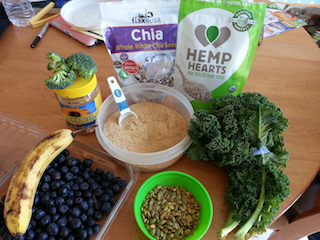 Pictured clockwise from left to right: banana-sunflower seed butter-broccoli-flaxseed-chia seeds-hemp seeds-kale-pepitas-blueberries. 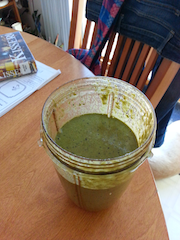 Step 2: Get a blender you feel will work best for you—personally I use a NutriBullet. Step 3: Combine and blend—this may take two blending runs to allow room for all of the food you’ll be combining together. 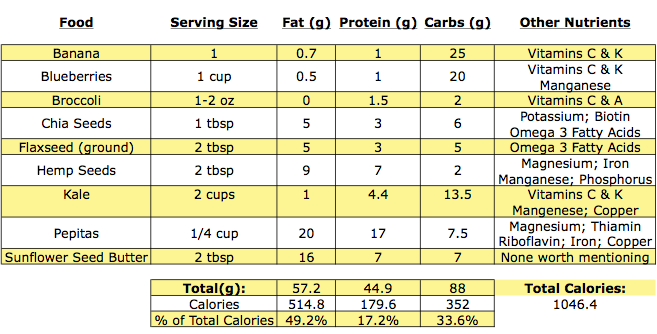 Exact serving sizes used is listed below. Add water and or ice cubes to taste. Step 4: Drink to your health and prosperity! What is the nutritional value of this nectar of the gods? Don’t be freaked out by the total fat coming in at 57.2g. This is high in omega-3 fatty acids that help to reduce your body’s inflammation, lower triglycerides, provide energy, satisfy hunger, help with cognition, and makes up the membrane in every cell in your body. You can also throw away your protein powders since at nearly 45g, you’ll have plenty to stimulate muscle development, repair and maintenance for your training and aesthetic needs. In fact, if you’re a 180# male at 15% body-fat, this is 1/3 of your daily needs. If you’re a 140# female at 20% body-fat, this is roughly 50% of your daily protein needs! The total carbohydrates are equal to two cans of pop, but what a difference in nutritional offerings! This is a perfect post training meal if you’re looking to replenish energy stores or a pre-game meal if you want to be ready for the fight! If you have insulin sensitivity concerns or prefer fewer carbs, you can drop the banana and reduce the blueberries to ½ cup. Why waste your money and time on eating foods that offer little return on your health and bigger dents in your wallet in both the short and long-term? Be a Super-hero in your choices!